The Metaphor Map of English shows the metaphorical links which have been identified between different areas of meaning. 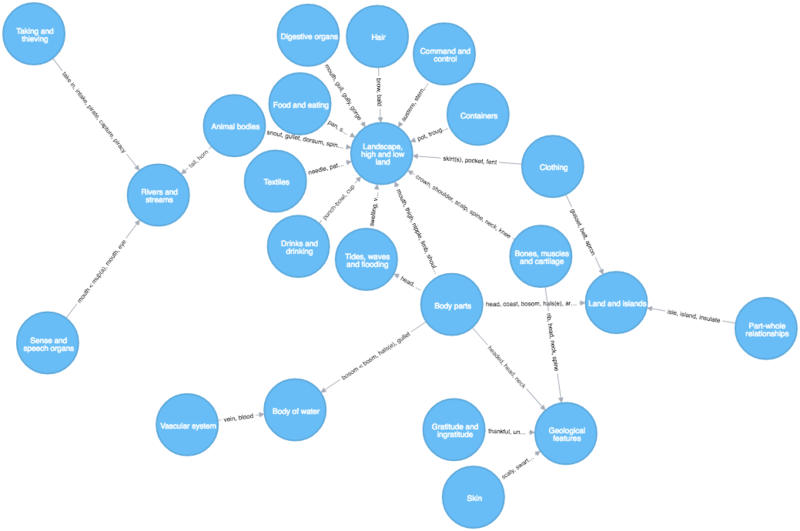 Learn how to import the mapping metaphor into Neo4j! I came across this tweet, which sounded really interesting. The Metaphor Map of English shows the metaphorical links which have been identified between different areas of meaning. These links can be from the Anglo-Saxon period right up to the present day so the map covers 1300 years of the English language. This allows us the opportunity to track metaphorical ways of thinking and expressing ourselves over more than a millennium; see the Metaphor in English section for more information. The Metaphor Map was built as part of the Mapping Metaphor with the Historical Thesaurus project. This was completed by a team in English Language at the University of Glasgow and funded by the Arts and Humanities Research Council from 2012 to early 2015. The Metaphor Map is based on the Historical Thesaurus of English, which was published in 2009 by Oxford University Press as the Historical Thesaurus of the Oxford English Dictionary. When most people think of metaphor, they cast their minds back to school and remember examples from poetry and drama, such as Shakespeare's "Juliet is the sun". This is unsurprising; metaphor is usually described as a literary phenomenon used to create arresting images in the mind of the reader. However, linguists would argue that metaphor is far more pervasive within our language and indeed within thought itself. All the data is available here (or you can download the CSV from here). Useful natural language correlation networks are always fun to work with, so let's have a look at it in a graph database. Copy metaphor.csv into the import folder of your database (“Open Folder”) or in an http-accessible location to load via an http-url. A more elaborate model could model the Metaphor as node, with the Words too and Era too and connect them. I was just not sure, what to name the metaphor, that information was missing in the data. But for this demonstration, the simpler model is good enough. I rendered the category nodes pretty large so that you can read the names, and have the “Strong” links display their “words” instead. Funny that both importance and unimportance have such a high rank. There are many other explorative queries and insights we can draw from this. Let me know in the comments what you’d be interested in.